The only processing software with the ambition of teaching you NMR. It's easy! Here is the first page of the manual. Today I have closed my 15th year working into the same room. There's nothing to write home about. There's nothing even worth speaking about (at home at least). My relatives don't like me talking about what I am doing at work. Their opinions are already set in stone: I am a lucky guy (and also a genius) because I manage to be paid for doing nothing. They also believe that I am a stupid because I worked hard for finishing SwaN-MR and then I gave it away for free. This is the world we live into. May I claim that, if the world we live into is so difficult to understand, part of the merit is mine? A few of you keep asking me about a new "X" version. The below explanation (from 3 years ago) could not be clearer! It's all true. There's a joke only at the end of it. When I said "blues" I wanted to say that I feeled a little blue. My music tastes are catholic and I don't need sheet music (and nobody sent it...). I have a better reason to feel blue today. In a few months I will be forced to throw away my perfectly working G3 because Menarini is going to buy a Dell PC. No more SwaN-MR. I will buy Mestre-C and adapt to it. I think most of you, at least once in your working life, suffered for a similar (or greater) humiliation. You can understand how I feel. I don't feel humiliated. You feel humiliated only if you think about it. I just feel defeated. In other words: the situation could not be more normal than this. Another dramatic evolution was witnessed by the Mestre-C team. They have lost their main sponsor and are forced to walk on their own legs. I hope no-one of those reading here will never think about using that program without paying. This would mean the death of that program, just like SwaN-MR is virtually dead. If you really think the price isn't fair, please write the reasons to me. I will try to understand, not to convince you. Despite appareances, the programmer's work can (sometimes) be harder than the chemist's work. Mestre-C is already paying for a generally accepted form of ignorance. In every market sector (like food, furnitures, musical instruments...) the industrial product costs less than the hand-made product. It is not so for computer software. There are other programs on the market that cost ten times more, because they are 'industrial products' or 'industry standard'. In my tiny stupid brain this mainly means that the author has good chances of having already been fired by the time the product arrives on the market. In some houses you can find that, under the new floor, there is an old one. It was too expensive to remove it. Now consider the size of SwaN-MR: 852 Kb. Other programs are, on the average, 6 times larger than this. It doesn't take time to create heavy programs. It's the lean program that requires work. The heavy program simply contains tens of floors, whose effects are simply to increase the weight of the building and to reduce the height of the ceiling. This is the industrial way of programming. (This is also the way in which Mac OS X has been created). On my G3 size matters. The smaller the program, the faster. I would like to read your experience with newer Macs. More than anything else, I would like to know what's wrong in working in Classic mode. In other words: which important things cannot be done but would have become possible with a native OS X program? Coming back to Mestre-C: the program is elegant and useful, the customer support is wonderful, the name is well-known, the price is fair. I am curious to see how people will react to a freeware turning into a commercial product. Will people still stick to the previous, limited versions? I hope they don't. I hope they will give economical support to a promising company. My friends at Mestre-C labs are a little worried, but their competitors are even more so! This company has something new with it. Varian has released a Mac version of their main software product, but not the Windows version. Evidently they fear to enter in competion with Mestre-C, while they pretend that Swan-MR is already dead. Shamefully, they are trying to convince their potential customers that there's no alternative for the Mac to their VNMRJ. The truth is that SwaN-MR is still downladable and that it runs under Mac OS X (in classic mode). It has outlived (or killed) many other inferior (from a darwinian point of you) programs. How many Mac users still remember names like MacNMR, RMN, Nuts, Win-NMR? SwaN-MR deserved more respect. Should I get angry, I may do it again. I have the potential to add the VNMRJ scalp to my rich collection. It's only 24 years before I retire. I hope not to be angry, when the time arrives. After what happened to my life, it would be absurd to be upset by these minutiae. Today it's impossible to predict the future, but it's very easy to describe the present. As I have said many times, all versions of SwaN-MR 3.x.y (from 1995 to 2001) have been compiled with the Symantec C++ compiler. The developement of this compiler was halted in 1996, while the Macintosh has continued to change. It was in theory possible to change compiler, but the effort could only lead to a worse program, from all points of view: more bugs, more space on disc, more time to download it, more RAM needed, and, last but not least, slower operations. A few months ago I changed the internal disc of the Macintosh (a desktop G3 @ 233 MHz). I also installed System X. I was unable to install system 9, for unknown reasons (I suspect because this Mac is mute after an hardware incident occurred 2 years ago). It's not a problem, because I am happy with 8.1. From that day the compiler ceased to work. I think it has to do with HFS+, but I am not sure. I have tried to install the compiler and the system on an external disk (HFS), but it didn't work either. In conclusion I can't continue working on the present version of SwaN-MR and I can't explain why. The day I discovered the above fact, I had already decided to concentrate ALL my efforts on Mac OS X, so it wasn't terrible news. Today I know one more thing. I haven't enough time to port SwaN-MR to System X, nor at work, nor at home. When I am at home I have other priorities. Last year I started learning the saxophone and now I am a member of the 'Concerto Comunale di San Giovanni Valdarno'. It required a lot of work, because I started from absolute zero. Being that I have no skill or inclination in the field (and never will), I need to study hard even to play a simple march. When I am tired from playing, I still have other things to do, more relaxing than programming, but even if I want to program, time is short. When I am at work, I am able to find a couple of hours per week. They are more than enough to write what you are presently reading. They may even be enough to write small programs in ANSI C or small and stupid applications in Cocoa (not dealing with files). SwaN-MR is a complex application that deals extensively with files of many different types and with graphics of different types. I need 1 year only to learn the new things introduced with OS X and Cocoa. It's not only a matter ot time, it's also a matter of motivations. I was strongly motivated to write SwaN-MR because I knew that the final product was needed and useful. I was also curious to discover if I was really able to do it. Now, unless I make something better and more successful than SwaN-MR 3.6.1, which is unlikely, my efforts will be vain. It also happens that I am not curious to know whether I can do it or not. I still like programming, and that's all. It's a matter of time and motivations, but not a matter of money, unless we equate time with money. The compiler is included into OS X (a real bargain!) and both the computer I have at home and the one I use at work are fast enough. I already have everything I need. The present interface is old-styled. The program may become more productive with a modern interface. Nine years ago I chose a non-standard interface to create a faster (easier-to-use) program. Now it was the time to adopt a standard interface and make an easier-to-learn program. Many Mac users will soon appreciate having a program running under Mac OS X, only for this fact. My intention is to share the same file format with Mestre-C. All spectra would easily be moved among SwaN-MR, Mestre-C and the spectrometer that generated them (back and forth). The new file format would be a serious candidate for a new standard in NMR spectroscopy. A program specifically written for the G4 should be faster. Just because I have to restart from zero, all the limitations imposed by the current structure of SwaN-MR are dissolved. 3D spectroscopy would beneficiate from this, and it's just the first example that comes to my mind. Graphics on OS X can use Quartz instead of Quickdraw. This should greatly simplify exporting high quality pictures from SwaN-MR. If a spectrometer changes its file format, I cannot update the converter. You need to write an external converter by yourself. If I get involved again in programming, my neighbours would be tortured for less time by my saxophone. No need to learn new things for the rest of your life. You can bet that, as long as something called Mac will be sold, it will be contain System 9, just like today's Macs can run 68K applications. It's less sure that universities and industries will continue to buy a product (the Mac) that today is marketed to a different segment. Probably other programs that you use will never be ported to X, so you will keep using System 9 in any case. 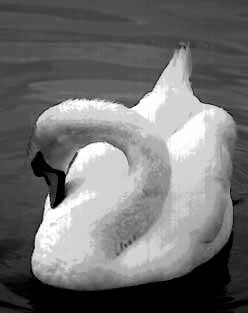 Knowing that SwaN-MR isn't going to change anymore may be, for one of you, an incentive to write the long awaited book 'How to Use SwaN-MR'. I have killed all the competitors in the Mac arena. If I leave the arena, someone else will find the space to enter or re-enter. Version 3.6.1 has been out there for 11 months and no bug has been reported. (I suspect there are some bug, and I am almost sure the converters are buggy). If we have survived so long, we can continue. Any application written in Cocoa, even the simplest one, is larger than 1 Mb. The performance too lets much to desire. I have tried so many times to explain that SwaN-MR is a commercial quality product which is freeware only for a combination of circumstances. If I am so stupid to write another free program, I will weaken my previous statements. Probably the world needs an obnoxious sax player more than a new NMR program. For the few of you wondering which size of sax I am playing, it's the alto (if you have unused sheet music, I will aprreciate the gift. Any genre is good, yet I like the blues).